The Bayer Children's Claritin Syrup 24-Hour Allergy Relief helps relieve allergy symptoms, such as runny nose, itchy-watery eyes, sneezing, itchy throat, and itchy nose. The Claritin for Kids Liquid Indoor/Outdoor Allergy Relief is the number one pediatrician recommended oral allergy relief. It provides 24 hour relief and is safe to use for children ages 2 and up. 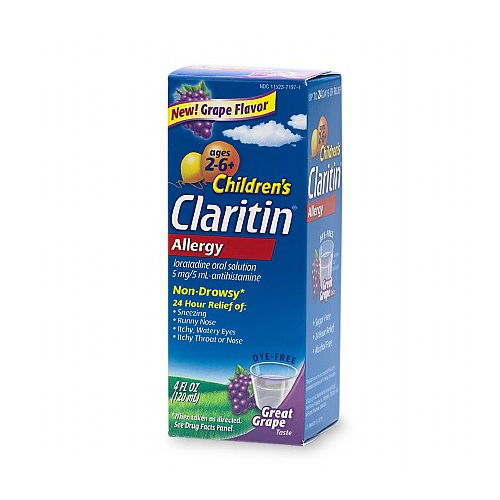 Claritin Grape Syrup Non-Drowsy Allergy Relief for Kids is sugar-free, alcohol-free, dye-free, and kosher approved. It has a tasty grape flavor that is 100% kid approved. For children ages 2 to 6, 1 teaspoonful is recommended once in a 24 hour period, for children ages 6 and up, 2 teaspoonfuls in a 24 hour period. Each teaspoon contains 5 mg of sodium and this syrup should be stored at temperatures between 68°F and 77°F. For adult allergy relief, you may want to try the Zyrtec Allergy Relief or the Banophen Allergy Relief Capsules.